Oh gosh…. 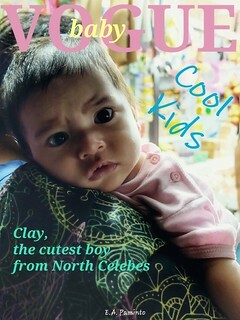 we met this very good loking, adorable, and cute toddler when we were on our way from Manado to Gorontalo. His name is Clay, a son of a court secretary in Boalemo Regency, Gorontalo Province. Her mother origin is Manado, but she has to work in Boalemo Regency. On Friday evening she takes a public travel ride from Boalemo to Manado and has to go back to Boalemo on Sunday evening, with her baby boy since he was like 3 months. Her husband is a worker in Manado city and the whole family are also there. He loves dancing while listening to dangdut music. We played him some dangdut music like goyang dumang, sakitnya tuh di sini, etc from Bunda’s mobile phone when he was wide awake. The cover photo was taken near to Limboto city, a regency seat of Gorontalo Regency at 2 am when they were dropped from public travel before continuing their trip by taking another public travel to Boalemo for about 2 hours, and the photo below was taken in a food stall i-didn’t-know-where in between Manado and Gorontalo at 10 pm.